A singing maid of honor, a newlywed couple, and a fainting best man—what exactly happened here? 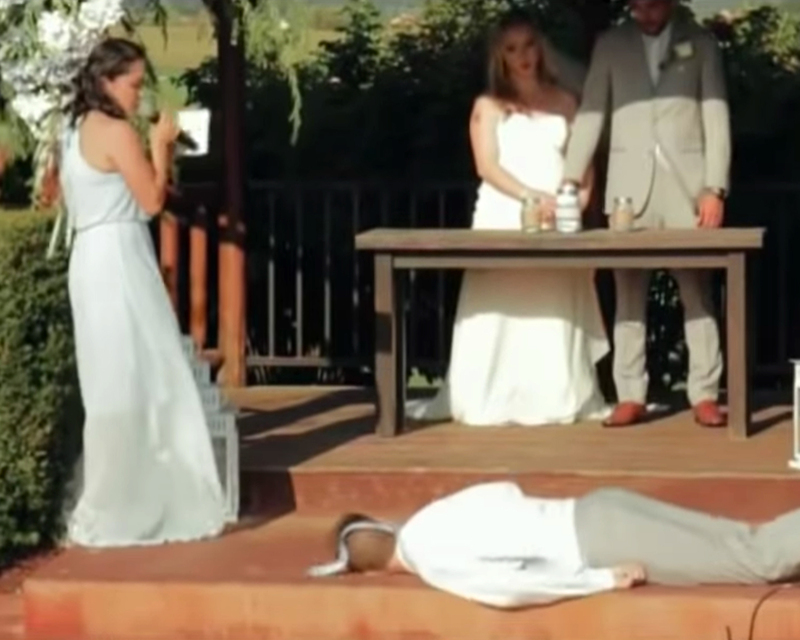 In a video that went viral online recently, one best man unknowingly wreaked havoc at his best friend’s wedding after face planting in the middle of the wedding ceremony, just as the maid of honor was struggling to get through a particularly emotional song. 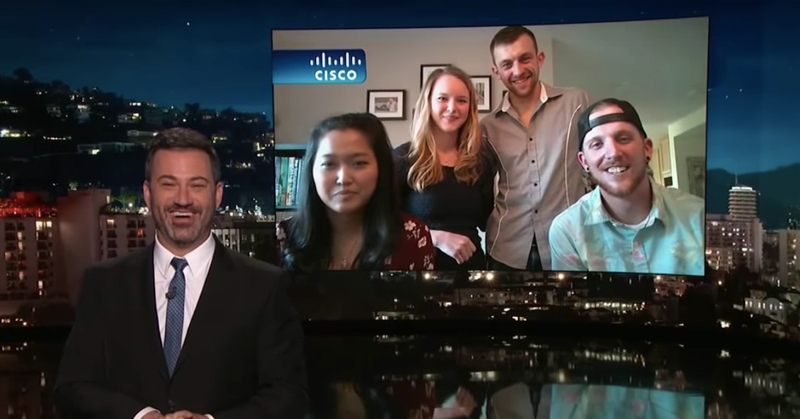 On Tuesday, March 19, Jimmy Kimmel tracked down the participants of the viral video to question them properly about what went down—no pun intended—that day. In the video, Tyanna and Denis of Brier, Washington, were looking on as Tyanna’s maid of honor Saung sang them her rendition of Ruelle’s “I Get to Love You” through streaming tears when Denis’ best man Jestin suddenly fell, face first, onto the hard concrete floor right before the altar. Jestin is later seen being led away from the ceremony by a few men who struggle to hold him up, the front of his pants seemingly wet. “That was the opposite of a standing ovation,” Kimmel joked to the foursome via teleconference. He then asked Saung, who looked particularly shocked in the video clip, what thoughts were going through her head at that point. Jestin, for his part, explained that unlike what many people may have assumed about a fainting groomsman, that he wasn’t blackout drunk when the incident occurred. “No, I wasn’t drunk, I wasn’t hung over,” he said. “I just didn’t have enough water and [there was] heat and we had a lot of fire so a lot of smoke. And of course, I locked my knees.” As for the dark spots down the front of his pants? Jestin explained that it was the result of water that several wedding guests had poured on the back of his neck to revive him. In the end, because Jestin was rushed to the hospital, Denis’ stepdad had to step in to read the best man speech, which the foursome admitted was quite a hit at the reception. Jestin, meanwhile, had to get stitches in his chin and repair his teeth, several of which cracked or fell out in the fall. “Congratulations on one of the worst weddings ever, I guess,” Kimmel joked. Be the first to comment on "Jimmy Kimmel Finds Out Exactly What Happened to the Best Man Who Fainted in That Viral Wedding Video"